As I mentioned last week when I first mentioned this project, I believe blogging is one of the best avenues to achieve success. If your dreams involve leading, helping others, or earning a living, blogging can go a long way towards making your dreams reality. But blogging can only do that if you blog well. So, I want to get better as a blogger, and I want to help you become a better blogger too. That’s why I’m excited to announce that on May 3 we are going to start a project to help bloggers take their blogs and their blogging skills to whole new levels. Several years ago Darren did a 31 Days to Build a Better Blog project. Thousands of bloggers participated as each day for 31 days Darren posted a blogging lesson & gave a homework assignment. I want to do 31DBBB with a group of people who are as passionate about blogging and self-improvement as I am. Experience is irrelevant. I hope the group includes some people who have been blogging for years as well as some who are just starting their first blog. Far more important than experience is passion and a willingness to commit to about an hour a day for 31 straight weekdays. 31DBBB Curriculum. 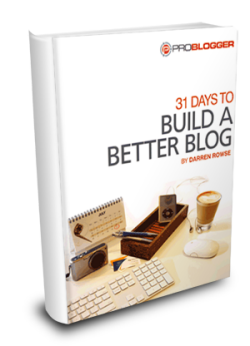 31 Days to Build a Better Blog has a lesson and some homework for each of the 31 days. 31DBBB was originally done on 31 consecutive days. I don’t blog on the weekends. I prefer to spend that time with family, friends, and my church. I want this to be an enjoyable rather than stressful experience & I want to include as many people as possible. So, we’re going to stretch it out over 6 weeks and only do it on weekdays. This also gives the opportunity to catch up on the weekend if you miss a day or two during the week. Blog Posts. Each of the 31 days, we will publish a post about that day’s lesson/assignment. I will write as many posts as necessary, but I want to give each participant the opportunity to do a guest post. Guest posting will give you an opportunity to introduce yourself & your blog to other participants. Blog Comments. Each participant is expected to post at least one comment each day. First, it will give us an idea of who is really participating. Second, it’s a form of accountability. I know when I have to contribute I read and think about a topic more thoroughly. Third, it reinforces the value that none of us are just takers but we’re all givers in this project as well. We all contribute insight in addition to receiving others insight. Link Love. As a little bonus, participants will be allowed to include a link to a blog post they’ve published that day. So, if you publish a post to your blog on a Monday, you can include a link at the end of any comments you post here on Monday. If you don’t post to your blog on Tuesday, when you comment here on Tuesday no link. This creates an incentive to not only participate in the discussion on this blog, but also post consistently to your own blog. Q & A. If you have general questions about blogging that don’t have to do with a specific day’s lesson/homework, those can be posted in OurChurch.Com’s General Internet, Computer, and Communication Discussion forum. You will have to register an OCC username to post. And the forums have a separate user database from this blog. One restriction. I have one request regarding the forums – don’t post asking people to go to your blog and give you feedback. Hear me out. I know everyone wants feedback on their blog. My concern is that without this restriction on Day 1 everyone posts to the forum asking for a review. Nobody is going to review dozens of blogs in one day, and so the end result would be a lot unresponded to forum topics and a lot of frustration and disappointment. I do think honest feedback can be very helpful to a blogger, and so I do want to help make that happen for as many people as possible. This is the best way I could come up with. Starting on Day 11, I’ll select 1 blog each day for all of us to review and provide feedback on. I think the best way to do the reviews is to have the blogger whose blog is being reviewed to publish a post to their own blog about the review. Include useful info like the purpose of the blog and the target audience. Then ask the questions you’d like feedback on. I’ll notify you 2 days in advance of when you’re blog is to be reviewed. I’d like you to publish your review post the night before & then send me the URL so I can include it in the next day’s post. Then other participants will be able to post their feedback in the comments of your post immediately. The end result should be that the 21 bloggers who are the most serious about improving and contribute the most to others in this project will receive the benefit of a review. Fair enough? OurChurch.Com is going to give a year of our Silver hosting package (a $199 value) to every blogger who completes all 31 days and posts a comment to all 31 day’s posts. OurChurch.Com will also give away to one lucky winner both our Christian Search Registration and Major Search Registration services (a $158 winner). Each day a blogger participates will give them an entry in this drawing, so the more days you participate the better your chances to win. Sorry, no iPods, iPads, or trips to Hawaii. The benefits of becoming a better blogger and building relationships with other bloggers through this project will far exceed the rewards mentioned above. However, we also expect real, tangible improvements in your blog. When you sign-up we are going to ask you for a few statistics about your blog. Then when the project is complete, we’ll ask you for those same statistics again. That will enable you to see how much your blog specifically has improved. It will also give all of us the opportunity to see on average how far we’ve come as a group. Rate your blogging expertise on a scale of 1 to 10 with 1 being a total newbie and 10 meaning you should be writing books on blogging. If you don’t know how to find these statistics, ask about them here in the comments or in the forum. To sign-up, complete this Google Docs form. I contacted Mr. Darren Rowse, aka ProBlogger, author of 31 Days to Build a Better Blog, and he has generously offered to give everyone who participates in this project 25% off the 31DBBB e-book. You’ll be able to purchase it for $14.95 instead of $19.95. After you complete the sign-up form, I’ll send you a link with a coupon code to get the discount. You must purchase the 31DBBB e-book to participate. You will also need to have a blog set-up, before you sign up. If you don’t know your blogs stats, sign-up and skip those parts of the form. We’ll help you find them & then re-input them into the form later. I’m also excited to add that we’re going to be doing this project in partnership with HighCallingBlogs.com. Their network includes more than 700 bloggers. The thought of having many of them both contributing to and growing from this project has me even more amped up. Whew! That was long. But did I miss anything? Got any questions? Comments? Anything you think really ought to be done differently? What do you think? Are you excited about the prospects of becoming a better blogger? Sir, I though your traveling posting give ideas for preparation of our further vacation. Thanks. The love of God through Jesus Christ is what makes life meaningful, blissful and worthwhile; without it, life is meaningless, frustrating and worthless. We've got 19 bloggers signed up so far. This is going to be great! Do accept posts on delivery businesses? Or business development? We publish guest posts about online communication and faith. Click the Be a Guest Blogger link at the top of the page for more details.